It’s been said that looking at pictures of the General Authorities in Mormonism is like looking at family reunion photos – not your family mind you, but of a family you probably don’t belong to. As time has waned on over the years, not much has changed in the Church’s selection of who’s next to fill the shoes of those in charge. Long story short – not much. With the exception of the Czech born, Dieter Uchtdorf, it’s safe to say, every single person in the Mormon hierarchy is related to each other in one way or another. We found that every apostle is either related to a past member of Mormon hierarchy, or they’ve married into a family with a long line of past Mormon leaders. The question of why is begging to be asked! Why does this look like a typical ‘good ol’ boys club, and not a Christian organization, outfitted and eager to share Jesus’ gospel to the world? I started looking into this subject matter after researching info on Franklin Richards for our latest installment of Polygamy and Mormon Church Leaders. After discovering how many of Richards’ descendants found themselves in high leadership positions, I simply began wondering how many other leaders had similar stories. 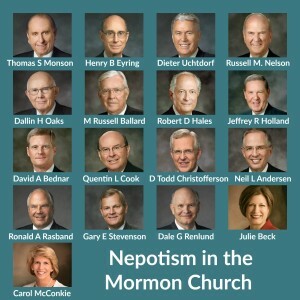 The story of nepotism in Mormon leadership has always been a well known fact, but I had no idea of just how prevalent this was until I rolled up my sleeves, and started looking at the evidence. D. Michael Quinn has done extensive research on this subject and published his findings in ‘The Mormon Hierarchy: Extensions of Power’, p.163-170. I strongly encourage everyone to grab a copy of his work because it’s definitely worth the read! What I’ve done here is to look at the latest group, including the three new apostles, to get an up-to-date picture of who’s who and what they’re doing behind those large closed doors. As far as choosing who will fill the shoes for the next prophet, in 1973 LDS Prophet Spencer W Kimball said that ‘death and life become the determining factor’. They offer no other explanation for how the process works other than stating they were chosen in the grand council in the pre-existence. See Ensign, January 1973 ‘We Thank Thee o God for a Prophet’. Why is death and life the only determining factor? Good grief, everyone does that. The apostle Peter gave specific details on the qualifications required for apostleship in Acts 1:12-26. Not one of the Mormon apostles have ever qualified for this position. We’ve listed info on each person serving in the Mormon hierarchy below. You can also get basic info on the 12 Mormon apostles and their prophet by clicking on the link ‘Meet Today’s Prophets and Apostles’. Elder Eyring’s father (Henry Eyring) and President Kimball’s wife (Camilla Eyring) were brother and sister. Married Melanie Twitchell, great-granddaughter of George F. Richards, LDS Apostle. Melanie was a daughter of Blaine Exeter and Marilyn Woodbury Twitchell. Marilyn Woodbury was a daughter of Nina Richards, daughter of George F. Richards, LDS Apostle. Rasband was also a member of Huntsman Chemical board of directors. Son-in-law of Merlin R. Lybbert, 13th general president of the LDS Sunday school. Daughter of UT Governor Norm Bangerter, Pres. of 70 – he was married to Colleen Monson William Bangerter, Norm’s brother, served as the Assistant to the Quorum of the Twelve Apostles. He was the last person holding the position, as it was abolished afterwards. First counselor in general presidency of the Young Women organization of The Church of Jesus Christ of Latter-day Saints (LDS Church) since April 2013. Mormon’s with that whole polygamy thing are all a very tight nit bunch. Your premise that there is some big nepotism thing going on is actually really easily explained. Almost every Mormon with Pioneer ancestry is connected to the leaders or former leaders of the Church. Nothing to see here, sorry. I’m quite an average Mormon and I have a lot more ancestral connections to past leaders than most of the leaders you highlighted. Agreed Griffin – I’m a tattooed, bearded Mormon (which is very much accepted by my ward and members around me), and I’m related to just about everyone person on this list, including the people they are related to. It’s not uncommon for a person who comes from an old Mormon family to be related to all these people. You have to realize the church was much smaller, much more recently than we think. Our ancestors all married each other because there was no one else to marry. Nepotism – hah – I’m pretty sure most mormons can trace the same lineage as the general authorities. I just happened onto your nepotism list. I have no “high” calling as you might interpret it in the LDS church, although I have had and still do have leadership responsibilities . But at the same time I wasn’t born yesterday, and there are several errors in your grand idea of feeling sorry for yourself by thinking your psyche will be satisfied in taking up cause to so called exposure of something that has nothing to do with nothing. Now, I will tell you a couple more things that I know for a fact. Let me start with one example and I will end with one other. The first is Julie B. BECK, she grew up in Highland UT. She also went to grammar school with me in American Fork, UT. Her parents were very close friends with my parents her mother is Geraldine Hamblin Bangerter, her father is NOT Norm Bangerter, in fact Norm Bangerter former governor of Utah never lived in Utah County, instead her father is Grant Bangerter, who took his young family to Brazil on a church building mission for three years. Julie was one year ahead of me in school, and her brother that was in my class is Grant Bangerter Jr. (also a building contractor). Now to tell you the relationship of Governor Norman Bangerter to Julie’s father, they are cousins. If you want to further delve into this, why don’t you further embarras yourself by contacting Julie, and apologize to her for your inept and reckless publishing of totally wrong information. Now, my second point I promised, in short it has to do with who is related to who, if you can take another slap in the face. The truth is, we are all related, going back to Adam and Eve, but not just there. In the LDS church a fair majority are related in one way or another, partly because of polygamy, and let me say it this way: just because we’re connected to one another through polygamy does not mean we are more or less privileged than anyone else. In fact, it really has as I have already said, nothing to do with nothing. You can call it what you want but I don’t sympathize with your lopsided view of the internal workings of the LDS church. Besides that, why do you care what they do, move on in your life, being bogged down is not worth the worry of it all. Maybe a good suggestion would be to take your hoo-ha page down. Cronyism is more common and hurtful in all wards through utah. The good old club destroys lives and testimony. It is exclusive and needs to be stopped. There is no room for it in the Lord’s church.